The fourth installment of WayForward Technologies’ Shantae series launches today, and the half-genie’s latest shape-shifting platforming adventure looks as good as it plays. Originally posted 12/20/2016—The game’s now out on the Switch, which is an excellent place to get to know Shantae if you haven’t already. The Shantae series launched in 2002 with an eponymous platformer for the Game Boy Color. After a couple of failed sequel attempts for the Game Boy Advance and Nintendo DS, Shantae finally returned in 2010's Shantae: Risky’s Revenge for the Nintendo DSi. That critically acclaimed platformer was followed by 2014's Shantae and the Pirate’s Curse, launched for the 3DS in 2014 and later ported to the Wii U, PlayStation 4 and Xbox One. Shantae and the Pirate’s Curse for PC. In 2013, WayForward Technologies launched a Kickstarter campaign for the first Shantae game developed specifically for PC and consoles. Between the Kickstarter and other donations, the developer more than doubled its goal of $400,000. Since then, fans of 2D platforming have waited patiently for Shantae: Half-Genie Hero. The waiting was so worth it. In Shantae: Half-Genie Hero, our magical protagonist and Guardian Genie of Scuttle Town must take on an evil force that threatens both the human and Genie realms. 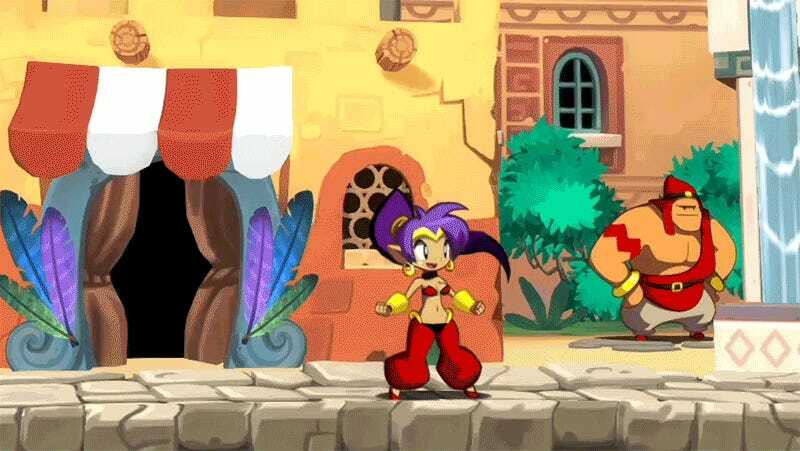 Armed with her whipping hair and a dab of magic, Shantae journeys forth to protect her town. It’s her job, after all. She wouldn’t want to get fired. If you’ve played a Shantae game, this is definitely one of those, only instead of an old-school pixelated affair, it looks like an animated cartoon. The visuals here are gorgeous, the music rich and varied and the gameplay smooth and silky. Originally slated for release in October 2014, Shantae: Half-Genie Hero arrives a couple of years late, largely due to fulfillment of stretch goals like additional chapters and extra playable characters. Again, so worth the wait. Check out my Facebook stream archive below for a look at the game’s first 40 minutes. Shantae: Half-Genie Hero is available today on PS4, Xbox One, Wii U, Vita and Steam.